The form of the Hurt Building, constructed from 1913 to 1926, was dictated by its irregularly shaped site and is one of Atlanta's numerous triangular-shaped buildings. Said to be the 17th-largest office building in the world at the time of its construction, it is a good Atlanta example of the skyscraper form that was developed by Louis Sullivan and the Chicago School. The main shaft of the building was erected in 1913 and the building was finished, with the exception of the decoration of the rotunda entrance, early in October of that year. 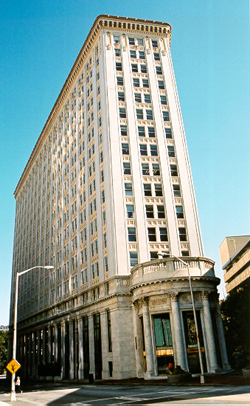 The Atlanta Constitution reported on September 28, that the new Hurt Building would open its doors about October 1, 1913. World War I delayed the construction of the wings and light court of the building until 1924, with the final portion of the building being completed during 1926. The Hurt Building stands 17 floors in height, and is composed of straight fronts, a flat roof, level skyline, subordination of ornament, a regular pattern of fenestration, and cornices of moderate projection. 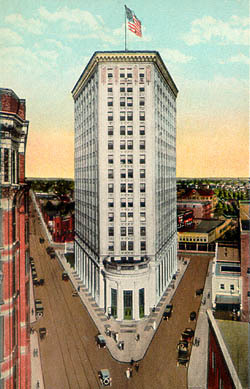 The four lower floors, which constitute the base of the building, were made to cover the entire allowable building site with the exception of the apex of the building--facing the main business section at Five Points--which was cut back 30 feet to allow a greater window area and a more majestic view of the building. The 13 floors above this base follows a V-shape arrangement: the two wings extend from the western apex of the property along both Exchange Place and Edgewood Avenue leaving an open light court between the wings opening toward Ivy Street. If any ornamental elements could be singled-out in the Hurt Building they are those of classical derivation. For, in addition to the classical details found in the rotunda, pilasters are also found which separate the windows of the ground floor, and a balustrade, located on top of the rotunda, is extended as an entablature down the sides of the building to mark the base. The rotunda consists of a moderate dome set on marble columns and, situated at the western apex of the building's triangular site, acts as the entrance level extending through the building to Ivy Street on the east. The Hurt Building also reflects the ideas and concepts of its builder, Joel Hurt (1850-1926). Hurt, an Atlanta engineer and builder, was a motivating force in many new developments in Atlanta. He was known to have made preliminary drawings for several years before he hired J.E.R. Carpenter, a prominent New York architect, well experienced in the design of high-rise buildings, to draw up the final plans for the Hurt Building. Hurt's training as an engineer helped in the final design of the building, as he strove to keep the "frills" of design down to a minimum and sought to create a more "efficient" and direct approach to design for the sake of clarity and unity. While the building is more ornamental than other streamlined buildings of the modernism school, the unity between structure and design is maintained, and it holds up well against more recent postmodern designs in architecture. It remains one of the most highly visible and architecturally important examples of early skyscraper construction in Atlanta. The Hurt Building is at 50 Hurt Plaza, in downtown Atlanta. It is an office building, and is not open to the public.